Rekindle your love affair with cakes through these awesome handpicked cake cookbooks. Elevate the home bakers repertoire of recipes with these cookbooks. The remarkable recipes in these books are bound to become family favorites year after year. Please and impress your family and friends, and get compliments on the yum, heavenly, to die for cakes from these books. Make every occasion a celebration - the annual bake sale, a birthday party, or even a simple Sunday supper. These cookbooks will quickly become your first choice to go to, when you are in the mood to bake. Celebrate your favorite holidays and special occasions from birthdays to bake sales, Halloween to Christmas - and even the everyday - with delectable gluten-free cakes. Has sixty classic cake recipes that are every bit as indulgent as the gluten-heavy ones you adore, but gluten-free, all-natural, and with alternatives given for vegan, dairy-free, and nut-free versions. Contains beautiful images and easy to read recipes. You'll find gluten-free takes of some of your favorite cakes in this book, from everyday coffee cakes, layered cakes, traditional cakes, and cupcakes to show-stopping special occasion masterpieces. Also has a section on basic and advanced decorating, piping, and plating techniques to take your cakes from pretty to breathtaking. This book will help change the way you bake. Great cookbook for those who want to combine their love of baking and nutrition. The recipes use no white flour or white sugar. Instead seasonal fruits and ancient flours (spelt, rye, buckwheat and nut flours) are used, to bring more depth of flavor and texture, and to create healthier baked goods. Though the ingredients are costly, but for a nourishing, love filled treat it's worth the occasional indulgence to make pure and wholesome cakes and desserts. The book is therefore more lifestyle inspiration than everyday cooking. It is an aspirational, yet very achievable, collection of recipes to guide you through baking in a more nourishing way. The book presents Elizabeth "Betty" Hinton's time tested family dessert recipes, told by her grandchildren Linda and Norrinda from the beloved Brown Betty Dessert Boutique in Philadelphia. The recipes are clear to understand, easy to follow. Each recipe accompanied with a beautiful picture and the story behind the recipe. And the cakes are moist, wonderful, rich, delicious - with high chances of them becoming family favorites. Now through this book, experience the best of Brown Betty in your home. The Loveless Cafe, Nashville, Tennessee, presents to you its more than 100 fabulous recipes of classic, southern desserts. The recipes and directions are easy to follow with minimal fuss, the ingredients easy to find - most you'll already have in your kitchen, and the result - easy to make, delicious, homey, desserts with a southern flair. Beautifully illustrated cookbook, it has great cooking tips sprinkled throughout. Highly recommended to anyone who grew up with these desserts and anyone who wants a little southern sweet in their life. If you love southern desserts and want to learn how to do it right, this is a must have book. In this beautiful cookbook, Bea's of Bloomsbury, London, shares with you recipes of its mouth-watering teatime treats. The recipes are inventive, and authentic; Bea has not kept any secrets back. Real recipes of real desserts that real people like to make, eat and enjoy. The recipes are easy, well written and each recipe has a lovely photo of the finished product. Bea's recipes will take away your nervousness of baking. Follow the directions, weigh everything using metrics, and you'll have way better results. Now enjoy Tea with Bea in your own home. Features more than 60 made-from-scratch bundt cake recipes from Kiss My Bundt bakery, Los Angeles. The cookbook has lots of good tips about ingredients, how to handle a bundt cake, and how to improve your baking experience. The recipes are easy to follow, step by step instructions, that remove any guess work and turn you into a decent baker. These are recipes that work, and taste great, with lots of imaginative flavor combinations. A small unpretentious cookbook chock full of tips, and delicious cake, frosting, and glaze recipes, to keep any avid bundt cake baker happy. In this cookbook, Rose Levy Beranbaum presents detailed, precise, clear, easy to follow recipes to delicious, decadent, and spectacularly beautiful cakes. Her recipes are easy to understand, with no questions left unanswered, making it pretty much impossible to make a mistake. Rose walks you through the recipe with a good attention to detail. The recipes list the ingredients by weight as well as volume. Almost every cake is photographed. A good cookbook, it guides home bakers to create cakes of all kinds with confidence and ease. With over 150 cakes, this cookbook presents many wonderful ideas for all kinds of cakes, for birthdays and everyday. It has a great variety of delicious cakes. There are cakes for every taste and occasion with lots of choice. The recipes are well-tested, clear, concise, easy to follow, with gorgeous pictures of the finished product of every recipe. The beautiful images entice you to make the cake, the photographs draw you in to select the cake just right for your event. A cake cookbook that is feast for the eyes. Filled with 250 foolproof recipes of every variety of British cakes. Many of the cakes are not present in American culture, so you may find it very inspiring to bake something completely new. Recipes are easy to understand and follow, with loads of handy tips. They are accompanied by lovely colour pictures. Full-color photographs and illustrations detail trickier steps. The dos & dont's and the information Mary Berry shares with you in this book will enhance your skills and knowledge of baking. This cookbook will open up your kitchen to the tastes and smells of Scandinavia. Its forty-four recipes are clearly written, easy to follow, and easy to duplicate in your kitchen. There is gorgeous full-page photography for nearly every recipe, as well as sidebars with photos that give more information about a particular Scandinavian city, tradition, or ingredient. A fantastic cookbook with beautiful photos and wonderful, great, authentic recipes that produce easy, consistent results. Bring the warmth of the holidays into your home with this treasury of easy-to-follow, time-tested, Jewish baking recipes, each written very clearly to guarantee success. The author, Marcy Goldman's instructions make the dishes fairly easy to prepare, with results that are fantastic, delicious, and perfect every time. The cookbook has extensive ingredients and equipment information, at the beginning, with great practical advice on baking from Marcy. If you are only going to buy one book on Jewish baking, this is the one to buy. 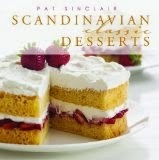 This wonderful cookbook presents to you almost 300 delicious, hard to find, authentic recipes, of new as well as classic, Swedish cakes and cookies. The recipes are well written, well explained, with great photos. Each recipe has clear, easy to follow, step-by-step instructions. Every recipe has a picture. And the recipes mention both metric and U.S. measurements. A great little baking book, whose recipes are easy, pictures are beautiful, and the recipes work every time. This unique cookbook presents to you recipes for a great variety of cakes, including chocolate cakes, bundt cakes, melt in your mouth cheesecakes, sponge cakes, layer cakes, roll cakes and many more. Its more than 200 recipes have been compiled from club, church and community cookbooks published across the country. The recipes are easy, with clear instructions, but with no pictures. A good collection of wonderful, simple, old fashioned, easy, uncomplicated, and absolutely delicious cake recipes. Some of the cakes are old originals that you probably won't find anywhere else. A wonderful cookbook on the many different styles of American cakes. This cookbook presents to you cake recipes from every state of the Union. The recipes are easy to follow and the book has lots of eye-catching photos. 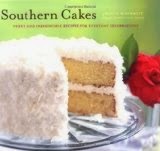 This is a cookbook with real down south recipes for a wide variety of wonderful, rich, moist, mind blowingly delicious southern cakes. There are old classic recipes and new recipes which are a part of the Southern tradition. The recipes are simple, well tested, clearly written, with instructions that are clear, concise, easy to follow, and results that come out perfect. The ingredients used are regular grocery store ingredients, that you may already have in your pantry. The pictures are beautiful. If you like homemade cakes like mom or grandma used to make, then this is the cookbook for you, with its recipes that any family would love. Beautiful cookbook with a wonderful collection of classic, delicious, fabulous recipes from times gone by. The recipes are pretty much as grandma used to make; about as authentic as you can find when it comes to old-fashioned baking. These are recipes that are tried and true and are passed down through the generations because they are loved and asked for by all. The photographs are gorgeous. The recipes are well written, easy to follow, and use ingredients that are easy to find. This cookbook may become a family heirloom, its that good. The cakes are vintage - like you remember from when you were a child, cakes that your grandma would have made back in the day. The old recipes have been updated with modern ingredients and measurements. There are nice classic recipes that are hard to find, some recipes you may have never seen before, of cakes that are forgotten. The ingredients are simple for the most part, and are ingredients you'll already have in your pantry. The recipes are true, tested, accurate, and well written. The directions detailed, precise, easy and clear. And the results - wonderful, delicious, that pack a flavorful punch. Forget regular birthday cake for adults, Booze Cakes are here. More than 108 yummy, fun, delicious cakes spiked with spirits, wine, and beer. The cookbook has easy to follow recipes, with beautiful pictures and interesting flavor combos. 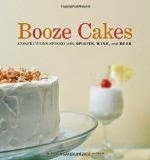 Has great tips and tricks on how to incorporate booze into your baking. The book also has a booze chart to let you know the percentage of alcohol that will remain in your creation after baking it. These delightfully tipsy desserts are perfect for dinner parties, potlucks, and pitch-ins. These are cakes that will be a big hit at parties and family gatherings. 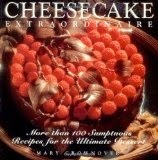 Great recipe book for making delectable, delightfully creamy cheesecakes. Mary Crownover takes the mystery out of baking delicious homemade cheesecakes. There is a wide variety of cheesecakes to choose from, including unique creations with fruits, nuts, and liqueurs. The instructions are clear, detailed, easy to follow. The pictures are beautiful and inspiring. The recipes turn out wonderful results that will make you a homemade cheesecake addict. A cheesecake lover's delight, this cookbook presents 50 New York style cheesecake recipes from the famous Junior's restaurant located in downtown Brooklyn, Times Square and Grand Central Station in New York. The recipes are the real deal - actual recipes used in the restaurant. The varied recipes are fail proof, easy to follow, with detailed instructions and lots of lovely pictures. The resulting cheesecakes fabulous, delectable, wonderfully delicious. The cookbook also has a great section on everything you need to know about making the best cheesecake in your home kitchen - right from the type of cream cheese needed to the pans to bake them in, to water baths to ensure their creaminess. A definite must-have cookbook for cheesecake fans who enjoy baking. These handpicked books are great gift idea for the family baker. The perfect holiday gift for your favorite cook. The best birthday gift for the wife who enjoys baking. Get these cookbooks as a gift for the colleague, friend or family member who is always baking cakes for all occasions. They'll love these. They are also great for newly weds, as part of a wedding gift or a bridal shower gift. Gift these as a Christmas present for your mother-in-law, a great mother's day gift for your mom. These also make a great hostess gift. All in all these handpicked cake cookbooks are great gifts to home bakers, to people who love to bake cakes as gifts, and ones who love baking.